The SpeedLine Pay@ the Door app is now available for Android. See what else is new with this convenient, fee-saving payment method. We first talked about Pay@ the Door last summer, but there have been updates, so it's time for another look at this innovative new payment method that lets your delivery customers pay on their doorstep, while saving you money on card-not-present processing fees and chargebacks. Get the details. The SpeedLine Pay@ the Door app is now available for Android, as well as iOS, giving you more flexibility in device selection. Operating system requirements are for Android 7.0 or later, or iOS 11 or later, and the device (smartphone or tablet) must have a cellular data plan. 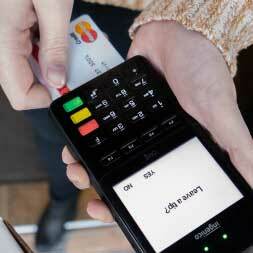 See how to pair an Android or an iPhone to the EMV PIN pad used to take payments at the door. Gift cards—Pay@ the Door accepts Vantiv StoreCard as well as credit cards. Email address prompt—order takers are prompted to ask for an email address when a customer without a recorded email orders delivery by phone. SpeedLine auto-sends a receipt to the customer. Slip reprinting—reprint Pay@ the Door credit card slips from Terminal. Are You Attending Pizza Expo? Visit SpeedLine at booth #1839. Come with your questions, see a demo of our latest features, and find out what's next. March 4 -7, 2019, Las Vegas. You received this email because you are subscribed to POS Quick Tips from SpeedLine Solutions Inc.